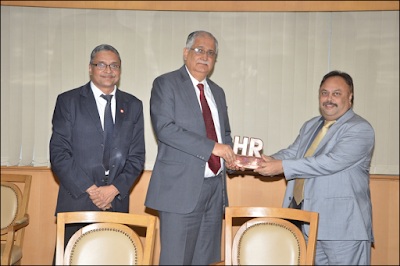 Shri Ranjan Dhawan, Managing Director & CEO, Bank of Baroda (centre) is seen holding the HR Excellence Award for “Best initiative for Engaging Superannuated Employees”. Also seen in the picture are Shri K V Rama Moorthy, Executive Director of the Bank (Left) and Shri S Gnanavel, Chief Learning Officer & General Manager of the Bank (Right). Bank of Baroda has been awarded HR Excellence Award by the Businessworld for “Best initiative for Engaging Superannuated Employees” at an award function recently held in Mumbai.